* What kind of Segway do you want to put this on? * Do you want to Purchase a Segway? Its construction is inspired by the lock industry; Robust, fail-safe and made to last. User-friendly, rich in features and upgradeable. The Sui Generis Seat is a Segway add-on, transforming this amazing self-balancing scooter from a standing to a seated version. The Sui Generis works by essentially “hacking” the Segway’s platform and making it operate as if the rider is still standing on it. The Sui Generis Seat not only guarantees a safe and easy ride, it also includes a seat glider for emergency braking and seat suspension for comfort. Why choose the Sui Generis over other seated Segway kits? Well first off, the Sui Generis Seat is the first to feature a seat glider. This ends up reducing the emergency braking distance by over 50% compared to similar products. In layman's terms, you can brake faster and smoother! The Sui Generis also features a seat suspension, shielding your back from the impact of uneven ground and rocky surfaces. The Buddy seat edition comes with a robust parking stand that anchors the vehicle to the ground when the Segway is turned off. People with limited mobility can get on and off in the easiest and safest way possible. Segways do not have any suspension. That’s not a problem when you are standing on them since any terrain irregularity (e.g. potholes) can be absorbed by your knees. It feels a bit like skiing. However, on a seated version, any such irregularities would only be absorbed by the tires, the cushion’s flexibility and the fat cells of the rider (if you know what I mean…). We find that this is obviously not enough if you are riding over a curb or a pothole. So we designed the Sui Generis Buddy seat to come with suspension that provides considerable shock absorption. 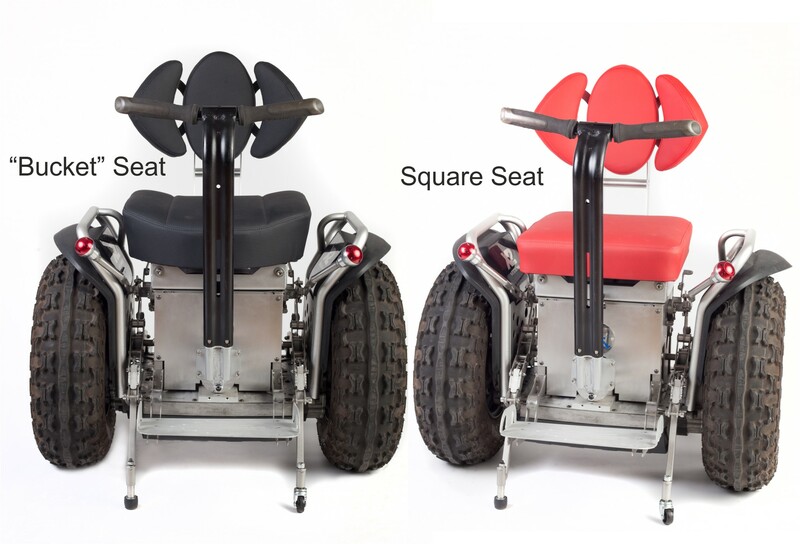 A “Buddy” with a square seat can be the lowest possible (59-60 cm from the ground on a segway i2 platform). That will help people who have to slide from a wheelchair in order to mount on the Sui Generis Seat. A “Buddy” with a bucket seat is at least 64-65 cm from the ground and its rounded corners will force rider’s legs to open. Bucket seat provides extra comfort and stabilization while turning. It is mainly for people who mount on the Segway from a stand up position. These are the differences. Both seats are equipped with internal suspension springs. Sui Generis Buddy Seat comes with two stabilization options. The parking stand is a sophisticated mechanism which stabilizes the Segway when it's not operating. In the unfortunate event of a Segway platform malfunction, a “Safety Shut Down” occurs. Ordinarily, you would have to get off the machine and load it on a car. However, some people can simply not afford to remain stuck on a dead seated Segway. 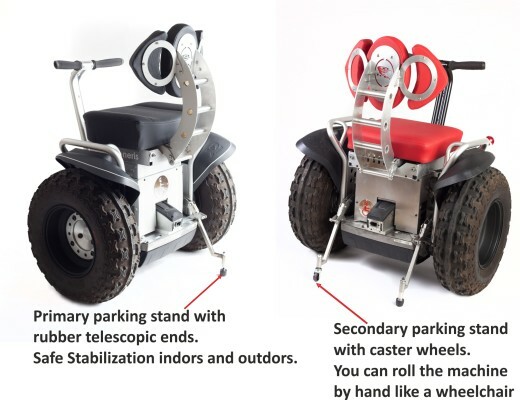 So we have created a solution for them: A second, independent parking stand with caster wheels, which allows the user to roll the machine by hand like a regular wheelchair! You can have your seat with one or 2 parking stands. The V-steer is an ingenious solution which allows excellent control of the Segway without anything sticking up the front of the user. Removable ends allow easy mounting and dismounting. Product Specifications: The "Buddy Seat"
*Seated self-balancing mobility products are custom made, imported, and are non-refundable upon purchase. Please see our Shipping and Returns Policy page. 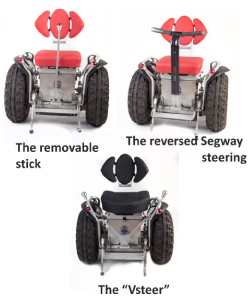 *The Segway/Airwheel Base is a separate product from the seat-kit and the seat kit will take a little installation to mount to the power base. An installation guide will be provided and Living Spinal will help instruct you if you run into any questions or problems during installation. Please call 619-810-0010 with any questions. Hello everybody I am Andrew and I am here today to talk to you a little bit about one of our Seated Segways "The Sui Generis". The Sui Generis is a really awesome device. It's got a lot of option sets and it's got a sliding seat pan. So let's go ahead and check out the Sui Generis livingspinal.com. So the first thing that we have got here is the seat. The Sui Generis actually comes with its own seat mounted on it. So you don't have to purchase your own seat. For some people maybe they have to be on a Roho and so, Sui Generis is one where the seat is part of the unit. So you may need to look at different options depending on what your seating needs are. As you can see here it comes in a buddy seat (square seat w/1 parking stand), it comes in the buddy seat (square seat w/2 parking stands) or it comes with a bucket seat (bucket seat w/1 parking stand) or bucket seat (bucket seat w/2 parking stands). So the simplified that a little bit, you've got a square or a bucket seat. The square seat is flat and the bucket seat actually has like a taper to the side and then in. So, somebody that maybe doesn't have the best balance, they might want a bucket seat to hold them on, kind of like you know race car you got that bucket seat. Let's move on to our next product option in that would be to add the "V-steer". The "V-steer" is actually the steering mechanism that would go on each side, so you can have a handle on both sides and then it's a 'V' that goes down under your legs and attaches down below. So you can actually steer with both hands at the same time or you could steer it just the left hand or just the right hand. Really a pretty neat steering option and pretty unique in the market. The next thing we've got is we need to decide what kind of Segway you're going to put this on. So whether it's an I2 or an X2. And then we have to look at whether the I2 or X2 is a non SE model or an SE model. So about two years ago, Segway stopped making non SE models and they came out with a new one called an SE model. So all of the newer Segways in the market that you purchase today are going to be SE models and all of the older ones out there are going to be non SE model. How do you tell the difference is the mounting plate for the Seated Segway steering arm is going to have five hole placements in a SE model, the newer model. The older models actually had a round hub that slides on to that area in between the tires. The next thing that we're going to look at is whether or not you're going to be finding a new Segway and purchasing that through us or you're going to have a used Segway that you're going to put just the seat on. It's fine if you want to do it either way. We don't always recommend getting a used Segway on the market because the batteries are so expensive on these things. It's about $2000 to replace the batteries and it's really kind of hard to determine whether the batteries are still good when purchasing the used model, a lot of times you'll be buying it on the internet or sight unseen and so we recommend you buy a brand new unit with a brand new battery so you’re the only one that is charging them and doing it properly. For Segways you want to keep plugged in all the time in the actually have really neat technology package that keeps the Segway operating its batteries and keeping them clean all by itself. If someone owned it before you and just left it in a garage for three months at a time they very well could have damaged the battery just that one time. So, the next thing that we want to look at is installation. So we have three different options in installation. One is "No Service" at all and we can send it right to you and you can mount it yourself. It'll come with mounting instructions and you can give yourself or if you have a mechanical friend who can help, that’d be great. The second option is for our "local corporate office here in Southern California" to go ahead and do the installation ourselves, but you pick it up here. The third option is to "install it shipped to your door" and we also have dealers throughout the country and we can have them do the installation. So lots of options there, again if you're working with a dealer, you just go ahead and put "No Service" because you'll be paying that dealer directly to do the service. Let's go ahead and work through some of the options that come on the Sui Generis. So we’ll go down the option page just a little bit, we've got the description, reviews, more information, similar products, really good to go through and read all this information on top of what I'm going to share with you here today. So let's go up to the pictures and I'm going to click on the picture set and that will bring up a picture viewer, for us to look at together. What's great here is that, we will see all different angles of it and you know how we talked about the seat. We have the flat seat and then we also have the bucket seat and you see how you can see a little bit of contour there. We're looking at the front of it, so it would be the rider’s right hand side. That’s got this red knob and that is what you would pull to bring the landing gear up. Now if you choose the dual landing gear, you'll actually have landing gear on this side as well. And this one has a small wheel at the bottom which will allow you to put the landing gear down and then roll it yourself. So it's really a safety precaution if you were to I don't know just not pay attention at all and then run out of battery and then you would be able to put down this rolling landing gear which you could then grab these large wheels and roll the device. Pretty unique not many of the units out there have a dual landing gear system. We have square seat versus bucket seat. We have got black, red, and it's a unique silver-chrome design for the actual material and makeup of the seat. You can get this center steer stick or that V drive. Lots of different options, great product comes from Brazil. If you have any other questions at all, go ahead and call into livingspinal.com, our customer service can go ahead and help you with some answers. You can pay for it directly through the website, you can call and give a credit card over the phone as well. If you want to do that. Thanks for joining us for our episode about Seated Segways and the Sui Generis. I have not been able to navigate the Jersey Beach since 2012. I tried wide tired wheelchairs but the effort to push through the sand took the fun out of the ride in a hurry. Looking for an alternative that would allow me to do the beach led me to seated Segways. After doing internet searches I purchased a Sui Generis. The seated unit Is purchased separately. The Segway I selected is an X2 SE Off Road with big tires. To make everything work together you must disassemble the Segway and install the seat mechanism. This took some time but the instructions are good. I am mechanically inclined if you are not possibly you should get help with the assembly. I took it to the beach and set the tire pressure at 4 lbs and road over the soft sand with no problems. The hard sand is like a race track with 10 mph my fastest two way average using my GPS. I would not ride in the water I don’t think theSegway batteries would like to get wet. The landing gear work well. They keep the unit steady while I get on and off. I use a medium paint brush to clean the sand off the unit after a ride. So far so good. The down side to my unit is the X2 is wider than most doors. It is for off road. The plus is the ability to go over sand and unpaved surfaces. I am happy with my purchase although I did not have an opportunity to try any other make of seated Segway.